Sherice Muhammad is the Commissioner of the Advisory Neighborhood Commission. She has over 24 years of professional career experience. She was highly involved in the growth and development of several non for profit organizations for 17 years. For the past 7 years Sherice has been working in government affairs. 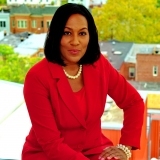 She has also been the Commissioner for the Advisory Neighborhood Commission in the District Of Columbia area for about a year now. Sherice has an incredible resume. She has gathered many different types of professional and personal experience over the years, such as Public Relations and Media for the well known network, BET ( Black Entertainment Television), Marketing Management for Johnson Publishing Company, Fashion Fair, Special Event Planning for The Chicago Urban League, the Salvation Army, as well as CEO and business management for ShoreBank. Sherice keeps very active in many organizations and participates in public speaking events, lectures and presentations for these organizations and non-profits. In the future she looks forward to becoming a fully fledged Lobbyist wants to be a trust worthy person for everyone to believe and trust in. One of her largest achievements as well as something she has been very proud of is when she testified against a merger of a major company. The mayor was trying to pass a bill regarding the merger and most of the population in the district did not agree with the mayor. Sherice was contacted by the mayor to come in and discuss the situation at hand. Sherice was able to go in there, discuss the problems peacefully and respectfully and actually made the mayor understand the perspective of the population.